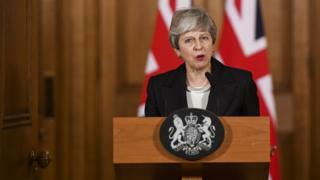 Prime Minister Theresa May has given a speech at Downing Street in which she has said that she believes the public have "had enough" of Brexit and just want MPs to "get on with" it. "Of this I am absolutely sure. You, the public, have had enough," she said. "You just want us to get on with it and that is what I am determined to do." People are "tired of infighting and political games", "tired of MPs talking about nothing else but Brexit" and it was "high time" politicians made a decision about what to do next. Mrs May said she is on the public's side and said she blames the delay to Brexit on members of Parliament (MPs), who have twice rejected the Brexit deal that she has laid before them. Why did the Speaker of the Commons get involved? Labour leader Jeremy Corbyn criticised the prime minister following her speech, saying that she was "unable to offer the leadership the country needs". This comes after Mrs May wrote to EU Council leader Donald Tusk asking if the UK can postpone Brexit until 30 June. He said that he believed the EU would agree to a short extension to the process, but only if the prime minister can get her deal signed off by MPs next week. 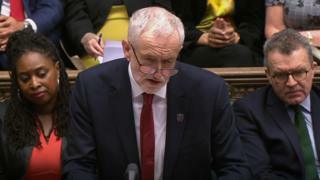 Labour leader Jeremy Corbyn responded to the speech, saying that the prime minister was "unable to offer the leadership the country needs". Currently, the UK is due to leave the EU next week on Friday (29 March), but it has not yet managed to agree on what the UK's relationship with the EU should be like once it has left the group. Mrs May has asked for a delay to the process - something that is of "great personal regret" to her - so that she can sort it out. She is due to travel to Brussels, in Belgium, where EU leaders are based, to have a meeting to talk about this. For Brexit to be delayed, all of the other 27 EU country leaders have to agree. Feb 2019: Will Britain's exit from the EU be delayed until May?